Here a summery of the Halpha behavior since Nov. 2017. If we take as scale the sum EW of the red and blue component of the last eclipse 1997 (Fig. right above), then we might say that the accretion disk is at present still not complete eclipsed. But this would be applicable only, if the size of the disk is the same then in the past. Within this campaign I had suggested, to try the determination of the disk diameter, based on the time difference of the eclipse between the blue to the red emission. The start of the eclipse of the blue emission is clearly to detect at around JD 2457900 (end of May 2017) followed by a steep decrease of the intensity. This is better to recognize in the peak height plot (Fig. left above) than in the EW plot (Fig. left bottom). The determination of the beginning of red emission eclipse however is still very difficult as long as we can not clear recognize its indubitable intensity decrease. This difficulty is linked with the strong periodicity (~ 43 days) we found among others in the ratio V/R (Fig. right bottom). This periodicity is still one of our very special observation results. If we can observe it also during the phase of the total eclipse and of course also afterwards, then we can be very sure to have detected for a first time a precession phenomenon of the B star accretion disk. A more comprehensive intermediate report written by Phil Bennett and me will be published during the next weeks at this forum. 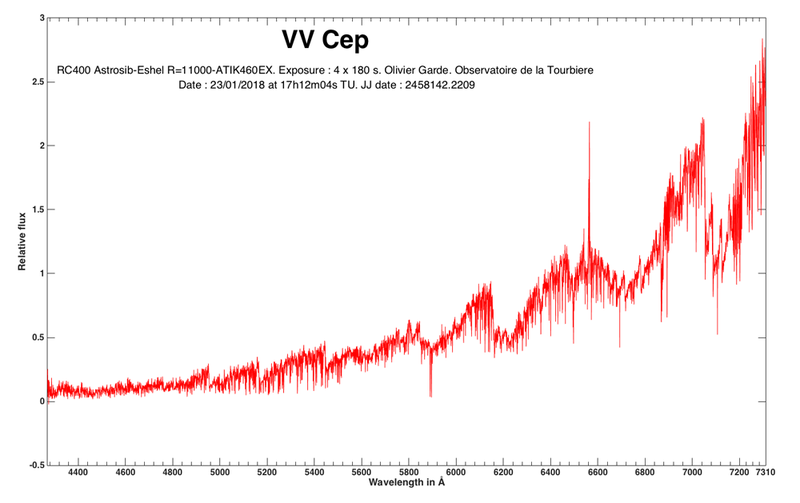 in the upper plot of the figure shown here, the total equivalent width of the Halpha emission of VV Cep can be seen. This plot states that, given the eclipse that has now been completed, it appears that the minimum depth of the last eclipse in 1997-99 is not reached. Question is, what is the reason for that? One reason could be that the disc of the companion don´t have the former size (diameter) anymore. The lower plot of the figure shows the still pronounced cyclical behavior of the V & R components of the Halpha emission. The period is unchanged at 43 days. We can be pretty sure that with this periodic behavior (for the first time in this system) we have found a libration of the disc rotation axis. Here is the question, why this has not been observed in earlier times. It is well known that the libration (i.e. the period) among others depends on the mass and the radius of the rotating body (spinning top movement). This suggests the suspicion that a libration at earlier times could not be observed, because a (significantly) larger disk mass (or disk diameter) resulted in a significantly larger libration period and these not had been found because of the much lower observation density at that time. I admit that this statement is strongly speculative. But I am convinced that the persistently continued monitoring of the coming years will clarify this connection. Phil Bennett, Peter Somogyi, Wolfgang Vollmann and I have written a summary of the current state of observation as publication for IBVS. As soon as it has been accepted, we will publish it here. We would like to ask the contributed observers for patience. with approach to the mid-eclipse, the amplitude of the Halpha V/R oscillation has been steadily decreasing for an unchanged period of 43 days, as shown by the three consecutive graphs (of Phil Bennett). The enigmatic nature of this phenomenon gives rise to the question whether the emission region around the companion star can be understood as a disk at all. Since the companion moves with supersonic velocity (about 30 km / s) through the wind of neutral hydrogen continuously ejected from the M-star, we assume that a bow-shock front in front of the companion produces the observed V-emission, while the R-emission is formed in the HII region behind the companion. Ernst Pollmann wrote: The enigmatic nature of this phenomenon gives rise to the question whether the emission region around the companion star can be understood as a disk at all. Anyway the idea of a circumstellar disc precession could still be acceptable/plausible if we "assume" a periodical eccentricity caused by shockwaves/wind/dust particles. Let me add, even my imagination of an external (or wide) Keplerian disk (that is yet other than the Be disk) - suggested by the VV Cep campaign's logo (https://www.shelyak.com/client/document ... nn_157.pdf - 1st page's artistic picture) looks to be inconsistent with the Bow-shock theory. In other words, to me it's hard to imagine the Bow shock coexist with an extended disk. The bow shock model looks to me as a replacement update to the older (70-80's) disk model. But, I don't think anything is sure yet - just better and less ideal models exist for VV Cep, definitely need a professional to finally confirm or reject (and when it happens, deserves higher scientific attention). Something I don't yet quite understand, why H-alpha is so much different than H-beta and above lines. Till the eclipse, EW of H-beta (and onwards) variations were in sync with H-alpha, but whilst H-beta switched off suddenly on mid of November, H-alpha still decaying slowly. So the question is, why the variation of higher Balmer lines EW is yet in sync with H-alpha variation (viewtopic.php?f=19&t=1798&start=80#p9863 ). Hydrogen alpha or 3-->2 energy level difference is only 1.89 eV, so in such an enormous gas envelope as with VV Cephei it stays the major and most favorite component even detectable during totality. the illustrations in the quoted OHP lecture served to give the audience a rough idea of the VV Cep system, according to the approximate ideas at the time. I had pointed out explicit in the lecture that these pictures (the only ones on the net) do not correspond to the actual conditions.